Three years ago, I bought an old home built in 1907. While the house was in “move in condition” there are areas of it that have clearly not been renovated for decades. The kitchen was one of these areas and while it had some amazing antique touches such as a tin ceiling and an original patterned glass window, most of it needed updating. 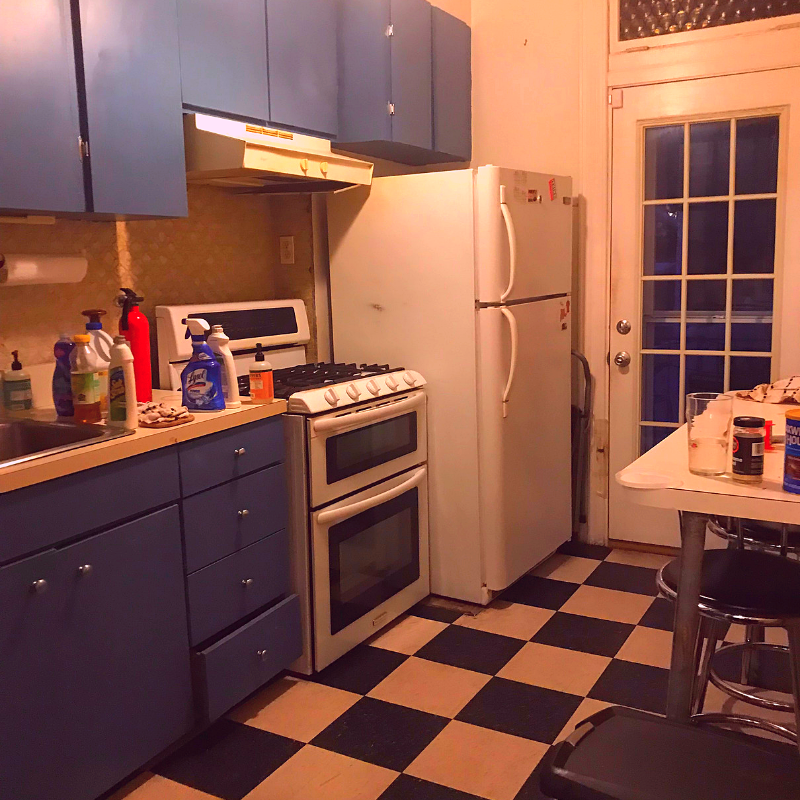 Some tiles were cracked and discolored and cabinets were wobbly. Seemed like time for a renovation! 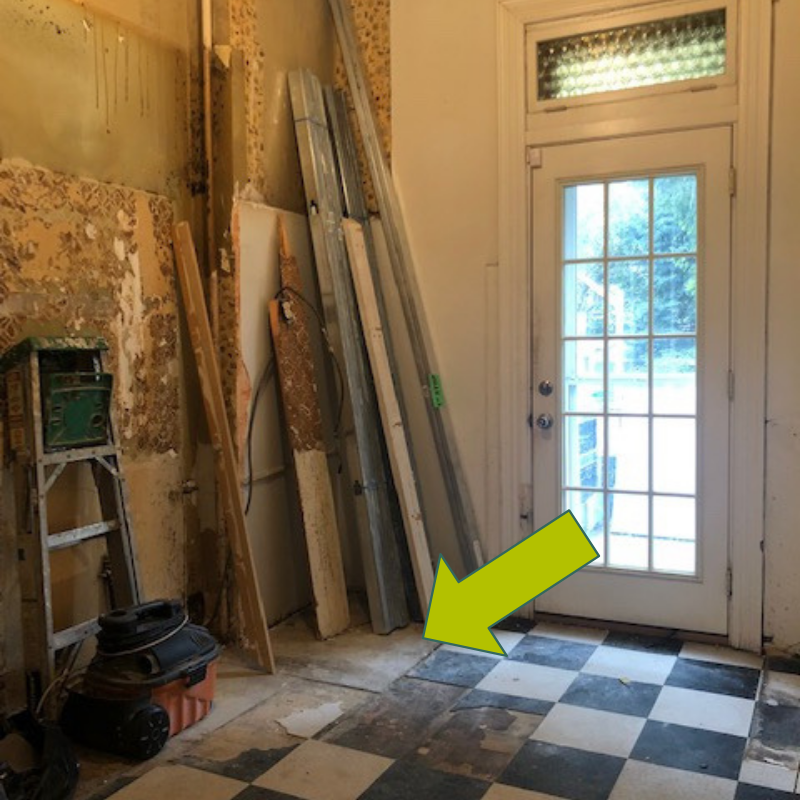 Even though you don’t always recoup 100% of your investment in a renovation in terms of increased home value, this puppy needed some love, ASAP! From talking to my neighbor across the street, she said there was a German woman who lived in the house for most of the last century and had updated the kitchen around mid century. Her name was Mrs. Butts. Or maybe Mrs. Butz. She did a nice job, but a lot of time had worn the finishes and flooring and it was time for a remodel of this old home. I had been warned that doing renovation on an old home was a bit of a crapshoot, as you never know what you will find! And that was certainly the case here. 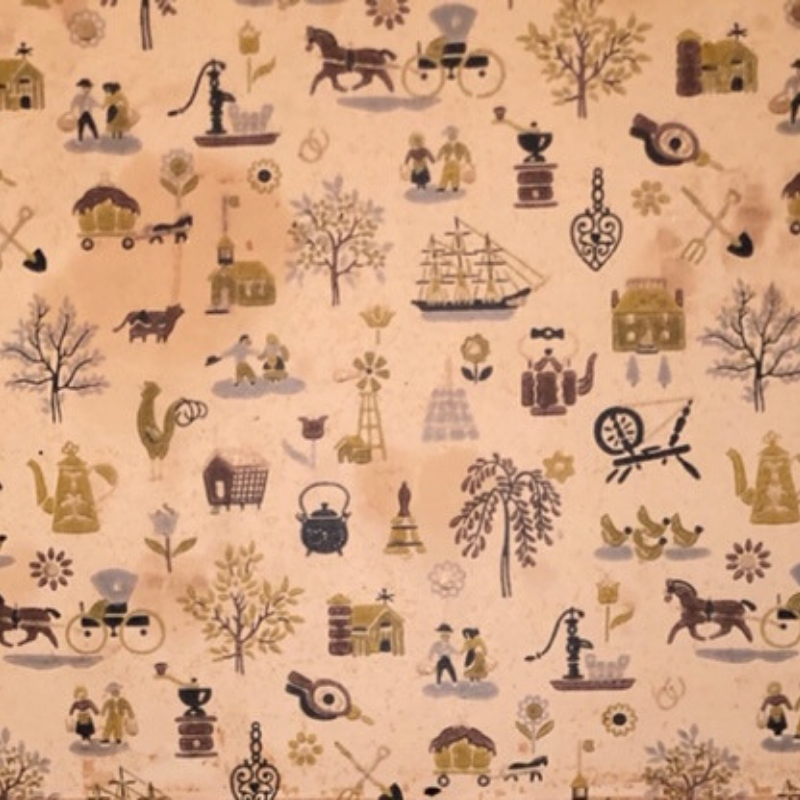 But there wasn’t enough wallpaper to save and do much with. Most of it had been peeled off in an earlier renovation. There was, though, a very shocking discovery in the corner of the kitchen floor. 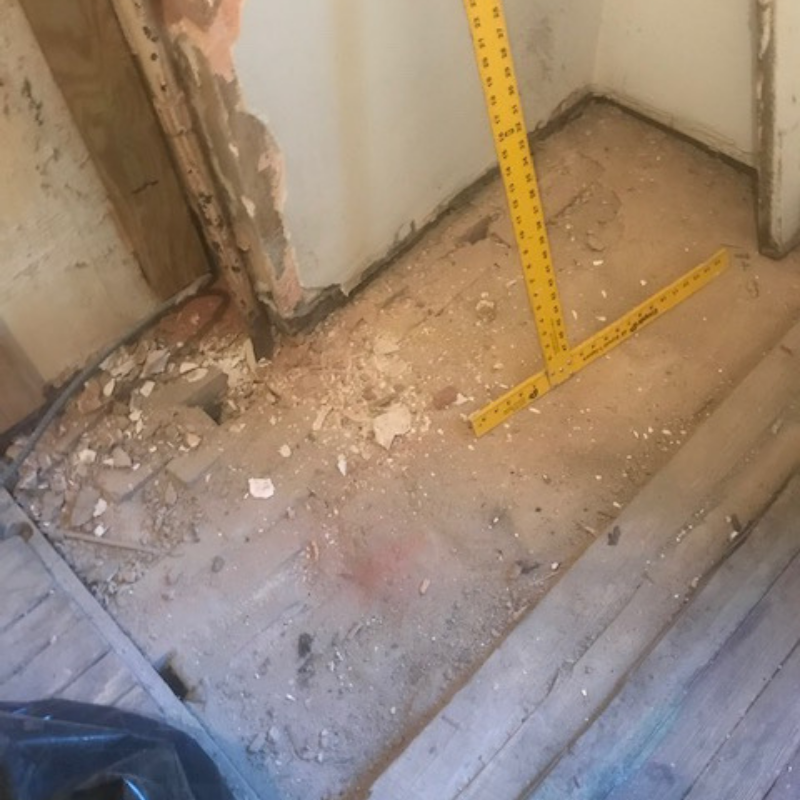 Underneath where the super boxy and heavy old refrigerator had sat, there was a 2 x 4 foot marble slab sitting flush with the wood floor underneath the linoleum. It is speculated that this marble slab was originally under a wood burning oven back in olden times. 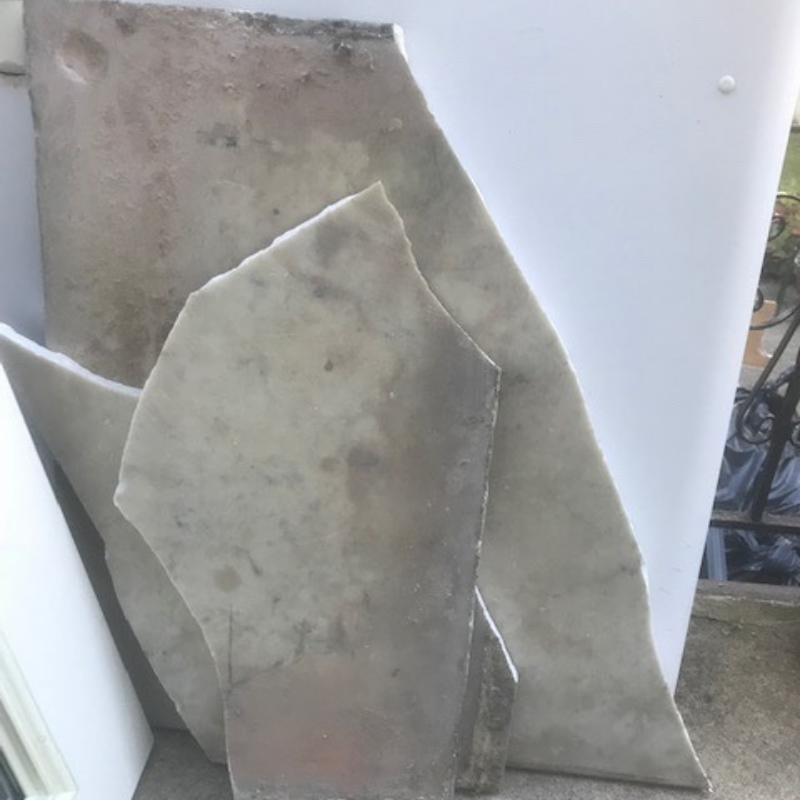 Probably a good design at the time, but what we found was that the marble slab had been laid in a wooden frame with no floor framing under it! And a heavy refrigerator on top! In fact, under the marble slab were bricks that were adhered to the marble and nothing underneath those. No floor, no subfloor, no supports at all. And what was directly under this in the basement? The boiler! 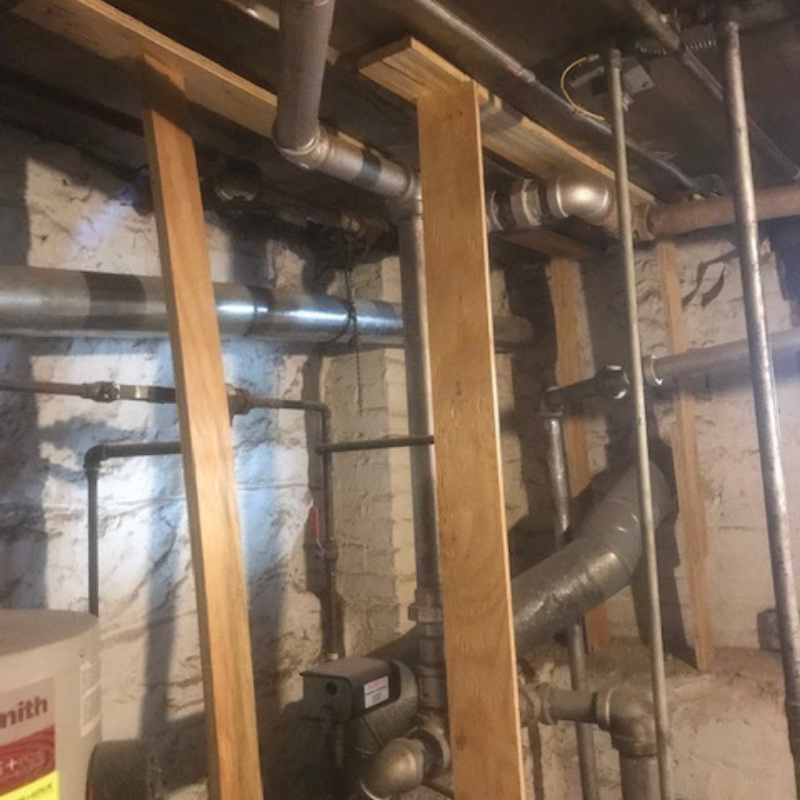 In order to protect the furnace during marble removal, supports were placed under the kitchen floor and above the furnace. On the ceiling there was a metal piece above the furnace that now makes sense, as this must have been to contain the debris from the bricks adhered to the marble. With the marble and bricks safely removed, the workmen went about building a new floor where there had been no supports. Thank goodness no one or thing will be falling through the floor in the future, due to sturdy new construction (though who knows what is lurking under the rest of my floors?). I hoped there would be no other surprises, but alas, there were. With any old home that hasn’t had a gut renovation, you usually have old pipes. Since my home has never been gut renovated, meaning, renovated down to the studs with all new wiring and plumbing, my pipes are, like the house, over 100 years old. Which means, they’ve already outlived their expected life span and could fail at any time. Also, some of them are in better condition than others, due to their usage, placement, and type. Alas, a brittle old pipe broke off and had to be replaced, adding, again, time and cost. All of these things little and big add time and money to the project. I was most relieved when we got to the point where we were doing cosmetic fixes only. 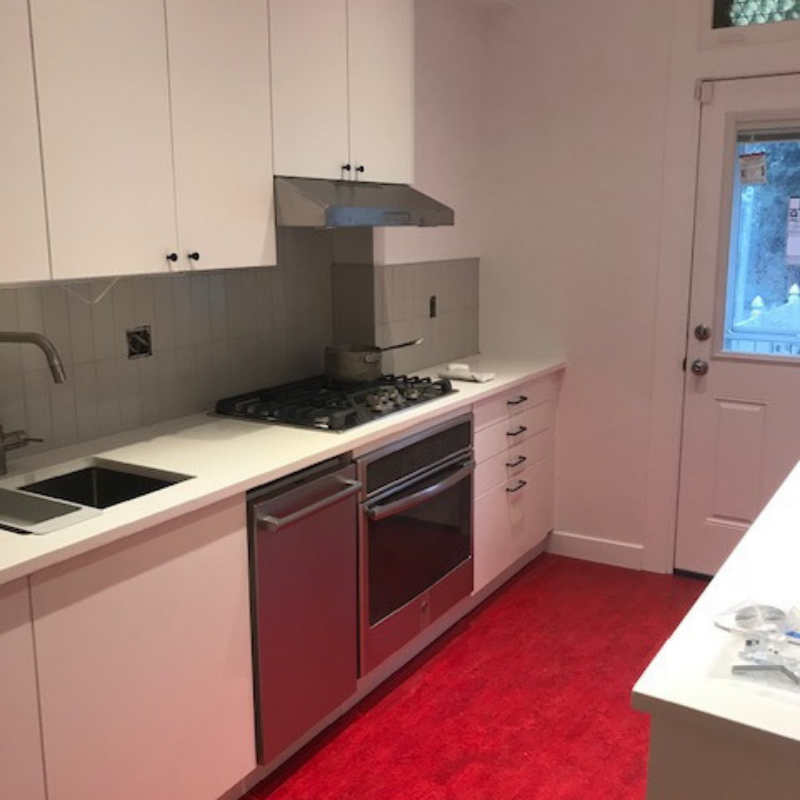 With the dry wall finished, appliances in, flooring done and electrical complete, the only thing left was painting and finishes, light switches and sockets, and other trim. This project, which was slated to take three weeks ended up taking five. Not so out of the ordinary for a project to go over the allotted time, especially one with the unknowns of working with an old home. How many renovations come in right on time? I’d love to know. Most people I know report longer times than first estimated, due to the unknowns present in any renovation project. 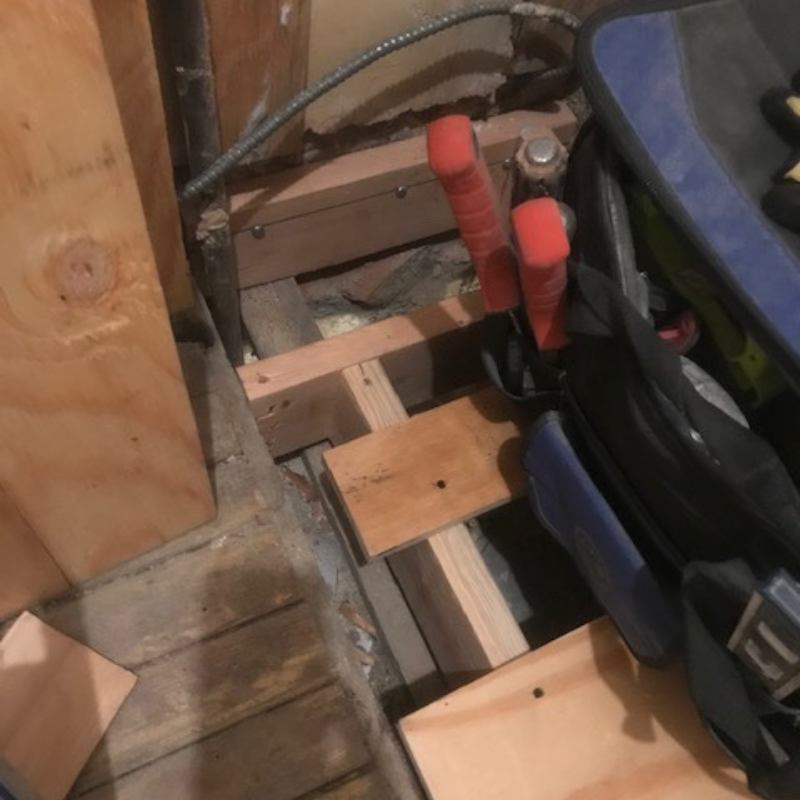 I will think twice about doing any other major renovation as the possibility of disrupting my aging plumbing system or altering the structure is bound to reveal new challenges! I’ll have to rest up (and save up) for future projects. 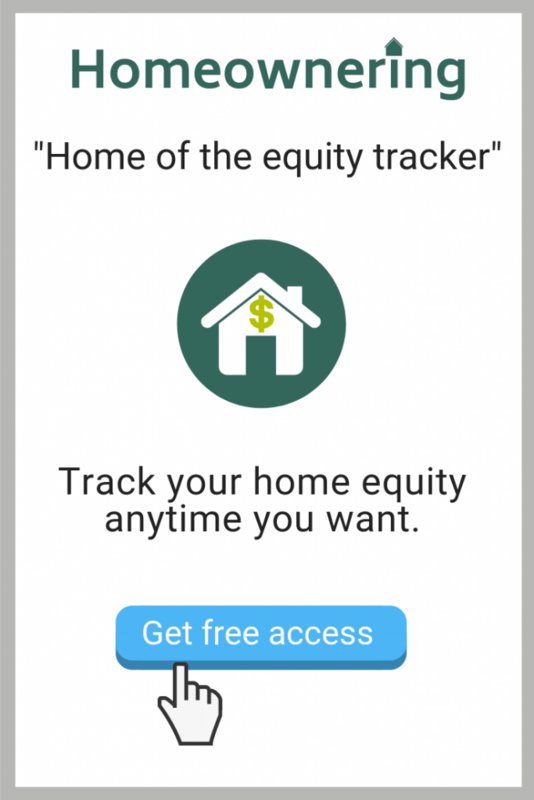 If you are interested in how much equity you have in your home, either before or after a renovation, head over to our free, instant equity report.